FFA - Sami Al-Arian, the convicted Palestinian Islamic Jihad facilitator who started the mosque that received a $2,500 donation from Sam’s Club, was deported. The Islamic Community of Tampa is also known as the Al-Qassam mosque named after the Military Wing of the Palestinian Hamas. Click here to send your email to communicate concerns to Sam's Club and Wal-Mart officials. Sami Al-Arian, founder and former chairman of the mosque to which Sam’s Club #6403 donated $2,500, was deported to Turkey on February 4, 2015 after serving 57 months for aiding associates of the Palestinian Islamic Jihad and refusing to testify about similar jihadist activities. Florida Family Association reported in an email alert and online article on September 24, 2014 that Sam’s Club donated $2,500 to the Islamic Community of Tampa, the mosque founded and chaired by Sami Al-Arian. The online article encouraged people to send emails to Sam’s Club and Wal-Mart officials. Sam’s Club and Wal-Mart officials received thousands of emails. 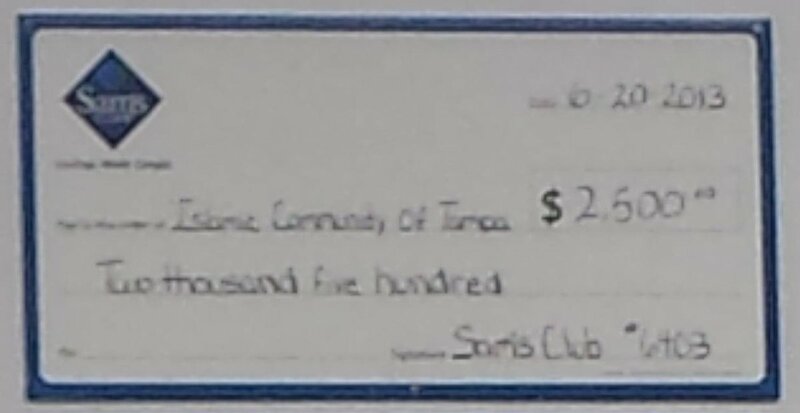 However, there was no response from Sam’s Club and the Sam’s Club store in Brandon Florida kept the photo of their generous donation to the Islamic Community of Tampa prominently posted on the wall for everyone to see at check out. Perhaps Sam’s Club and Wal-Mart officials presumed the controversy would go away. However, Sami Al-Arian’s deportation adds to the concern and controversy about Sam’s Club’s open, generous donation to a mosque founded by a man who the United States deported because of his support for the Palestinian Islamic Jihad and refusal to testify regarding other jihadist activities. Some of the history regarding this issue is posted at the bottom of this article. Florida Family Association has prepared an email for you to send that voices concern to Sam’s Club officials and parent company Wal-Mart officials regarding Sam’s Club financial support for the Islamic Community of Tampa and for not responding to concern voiced by thousand of Americans. 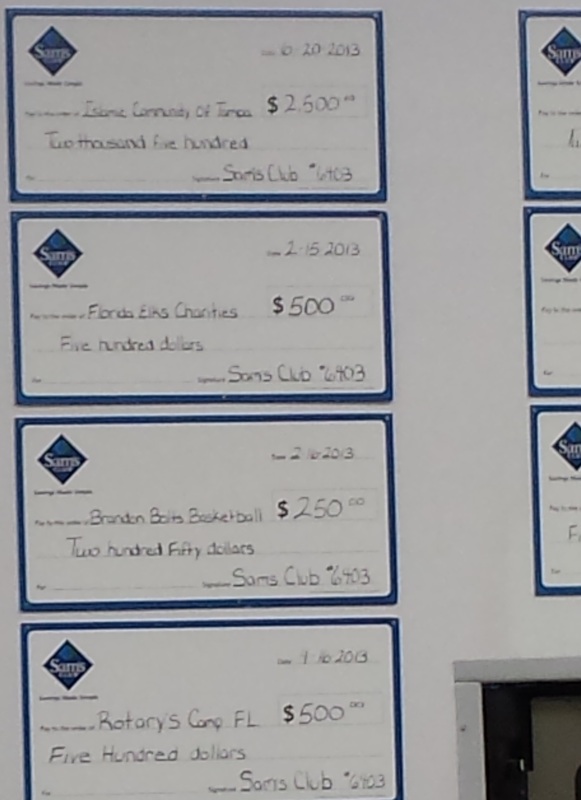 A Florida Family Association supporter happened to look up at the wall behind the checkout line at the Sam’s Club located at 2021 Brandon Boulevard in Brandon, Florida. He saw a large photograph of a check made out from Sam’s Club in the amount of $2,500 payable to the Islamic Community of Tampa located in the top left prominent position on the wall. Florida Family Association snapped a cellphone photograph. Photographs indicated that no other non-profit organization received more than $500. Did Sam’s Club and parent company Wal-Mart know the following when it gave this store’s largest non-profit donation to the Islamic Community of Tampa? The Islamic Community of Tampa is also known as the Al-Qassam mosque. The Military Wing of the Palestinian Hamas is called the Al-Qassam Brigade. InvestigativeProject.org reports “The mosque, according to Sami Al-Arian, was named after Izzedin al-Qassam. Al-Qassam, a Syrian killed fighting the British mandate in 1935, ‘is the main source of inspiration for the Islamic Jihad movement’ Palestinian scholar Ziad Abu Amr wrote in his book, Islamic Fundamentalism in the West Bank and Gaza. ‘The Islamic Jihad's supporters have elevated him almost to a saintly status.’"
The Hamas rockets fired at Israel are named Qassam rockets. Sami Al-Arian was indicted in February 2003 on 17 counts under the Patriot Act for allegedly being the leader of the Palestinian Islamic Jihad (PIJ). In 2006, Al-Arian pleaded guilty to one count of conspiring to make or receive contributions of funds, goods or services for the benefit of the Palestinian Islamic Jihad (PIJ) and was sentenced to 57 months in prison. Sami Al-Arian refused to testify before a Federal Grand Jury regarding other Jihad activities. U.S. District Judge James Moody ruled that Al-Arian must testify. A Virginia District Court held that Sami Al-Arian had no legal basis to refuse to testify. The court held him in civil contempt, and imprisoned him on November 16, 2006. 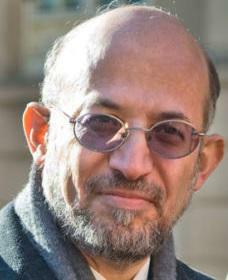 Sami Al-Arian was released from prison on June 27, 2014 after the United States Department of Justice dropped charges. Sami Al-Arian served as the Chairman of the Islamic Community of Tampa. The Islamic Community of Tampa has been a member of the Islamic Society of North America (ISNA) and derived their tax exempt status from ISNA. Sami Al-Arian’s letter written on Islamic Community of Tampa – Masjid al-Qassam stationery stated “We are an affiliated member of the Islamic Society of North America(ISNA) and derive our tax exempt status under 501 C 3 of the IRS code through them.” Click here for report regarding concerns about ISNA. The Islamic Community of Tampa hosted a propaganda event for the Council on America Islamic Relations (CAIR Florida) in February 2012. Click here for a report regarding concerns about CAIR.